Entrepreneurs are my favorite kind. I admire those who turn a vision and idea into something the rest of us can see and enjoy. And of course, having an innate passion for fashion myself, I love even more those who create pieces for us to wear and express who we are in a unique and very special way. Ginny Rush, from Liberatus Jewelry, is no stranger to this concept. Last year she gave life to a beautiful jewelry project creating very intricate and meaningful designs that also happen to be elegant and super trendy. Keep on reading to learn a bit more about her brand and the entire creative process. How/why did you start Liberatus Jewelry? After working conceptually for 4 years in the Crafts/Material Studies program at Virginia Commonwealth University’s School of the Arts, I decided I wanted my work to live on people instead of in a gallery. I decided that production jewelry was my calling. My love of jewelry stemmed from loving to work with my hands. For me, adorning the body with those creations engages the wearer and the pieces in a way no other art format can. So in January 2016, I took my love of creating something for people to make stories in and jumped off the deep end and started my business! Where do your ideas for a new collection come from? The name of the brand came from the latin word, liberatus. It means freedom and liberty. As a Christian maker, my freedom in Christ has been a big motivator. 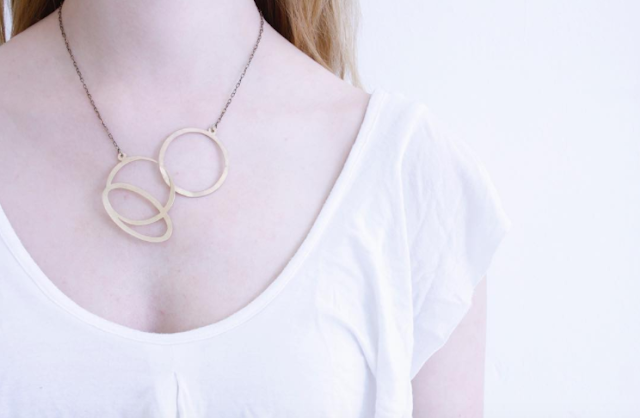 My Ellipse Collection uses intertwined circles to touch on the interconnectedness of myself to others as well as the connection of humanity and God. Even with faith in the back of my head, some studio experiments just turn out to surprise me. I’m a firm believer in the “if it looks cool, run with it” mindset. Happy accidents spawn some of my favorite work. What techniques do you usually use? “Piercing” and “soldering” are the technical terms for “cutting out little tiny metal shapes with little tiny sawblades” and “using an acetylene torch to fuse metal”. I also try to highlight file marks and sanding lines in the metal’s surfaces. It's a sort of signature that I was there and my hand made that mark. I love that I get to start this ring/necklace/bracelet’s story and then the wearer gets to add a new chapter. As they add dings and scratches to it with wear, our stories combine on the metal. Is there a specific type of woman you design for? My customer base has a large range. My hope is to make versatile handmade jewelry & men's accessories. I shoot for timeless yet modern and simple designs that are easy to dress up for work or a formal event or down for everyday wear. Anyone that likes effortless pieces and live-in styles. Any accessory designer you admire? I’m obsessed with the craft jewelry work of Ashley Buchanan and Tara Locklear. What has been your biggest challenge with the brand? Balancing my love of making with the necessity of business logistics. It’s really hard to have to put off experimenting in the studio to make sure my taxes get in on time for example. What have you learned personally/professionally since you created the brand? Personally, balancing a full-time job, wedding planning (194 days until I’m a Mrs!! EEK! ), volunteering at an art gallery, and running Liberatus can really take a toll on my sanity. I pride myself in keeping it together. So I have found that having helpful friends to keep me accountable is advantageous. A million color-coded planners and to-do lists help too! Professionally, it’s been interesting to look back and see how nervous and shy I was about taking advantage of opportunities. Now I have business cards ready, my elevator pitch memorized, and feel just a tiny less-sleazy about highlighting myself and my work. What’s the next step for Liberatus Jewelry? Next step would be to be bolder. It's been fun to stretch out my wings but now I want to fly! I hope to explore crazier designs, confidently and constantly seek new opportunities-whether it be collaborations, shows, or shop relationships. Where do you see Liberatus Jewelry in 5 years? This is the dream. I hope to be able to run Liberatus Jewelry full-time. I want go to shows & markets every weekend and have an in-home studio where I can jump on a new idea asap. I hope to be in several more boutiques and stores as well! Special thanks to Ginny, for taking the time to answer these questions (and congratulations, bride-to-be!). Make sure to follow her work on @liberatusjewelry.